The charcoal found on the territory of the village has long been called anthracite (just like the coal extracted from the Bully mines), but it is actually lignite. Formed at the beginning of the Carboniferous by the fermentation of pieces of floating wood that formed a deposit in the estuaries of torrential rivers, lignite is less rich in carbon than coal and especially than anthracite. It is quite impure here, its combustion leaves a lot of ashes. It began to be exploited in Audenet and Jœuvres in 1825 even if it was not very plentiful. On the side of the road of Audenet which led to the Loire river (now partially immersed), the valley of the Moutouse (river) starts. The duke of Bassano, looking for coal there, had opened a transverse gallery a hundred-meter deep. This gallery collapsed, was then filled and its trace has since been covered by abundant wild vegetation. If it had not been registered on a mining document dating from 1840, we would not know that this gallery existed. The path to the gallery came directly from the hamlet of Fragny (a hamlet in the commune of Bully where a larger deposit was exploited until 1936). The coal deposit continued on the other bank of the Loire river, to Jœuvres, another hamlet of the village. 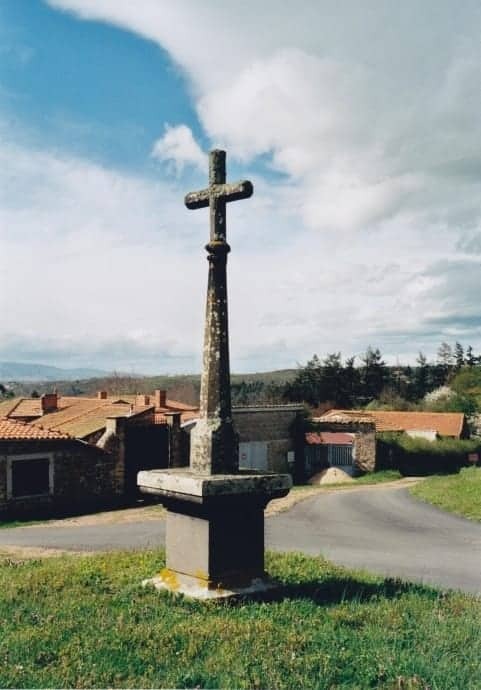 There is no trace of exploitation, but a large stone cross in the middle of the hamlet dedicated to Sainte Barbara, patron saint of miners, which evokes this mining past. On this cross one can read: “Mary conceived without sin pray for us” and on the base “Sainte Barbara, pray for us”. It was erected in 1861 by Mr Victoire Brissac, owner of the mine, probably to protect the miners, or for the mines to give more coal. Indeed, on the report of the meeting of the Local Council of 14th March, 1875, one can read : “The council believes that the concession of Jœuvres and Audenet must be withdrawn from its owners because of continuous non-exploitation for many years. This decision meant the end coal mines in St-Maurice.